Most of the werewolves in folklore, film and books are usually these monstrous and ferocious beasts that turn anyone unlucky enough to cross them into nothing but a pile of bloody pulp. But among the chaos and gore is one old folk tale of a sweet and kind werewolf. 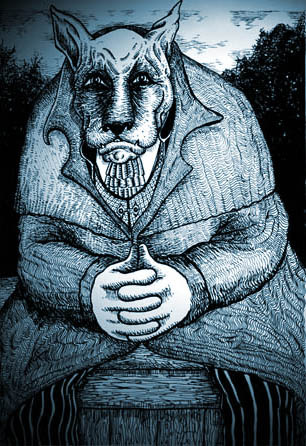 The unique werewolves I am speaking of are the Galley Trots, also known as Wulvers, which come from the Shetland Islands of Scotland. The wulver is described as a normal man covered with short brown hair, but what is not so normal is that this man has the head of a wolf. As long as the wulvers are left in peace they show no aggression to anyone. The best known stories about a wulver claim that it would spend its time sitting on a rock and fishing. That rock is still known today as “The Wulver’s Stane.” When the wulver was finished fishing it was known to leave some of its fish on the window sills of poor families. But like most supernatural creatures, there are a few bad stories about wulvers as well. In some versions of the myth they were mainly associated with old burial grounds and ancient buildings. Their presence was once thought to indicate that valuable items or money was hidden nearby. There was also the belief that to see a wulver or galley trot was an omen of approaching death. In some parts they said they would only appear to sit mournfully outside the home of a terminally ill person. Even those “bad” things pointed out above aren’t actually all that bad compared to other werewolf stories out there. Sometimes those stories of scary fanged beasts ripping bodies apart with their claws and then getting shot by a silver bullet get old. So it’s refreshing to have at least one old folktale about a helpful and compassionate werewolf.